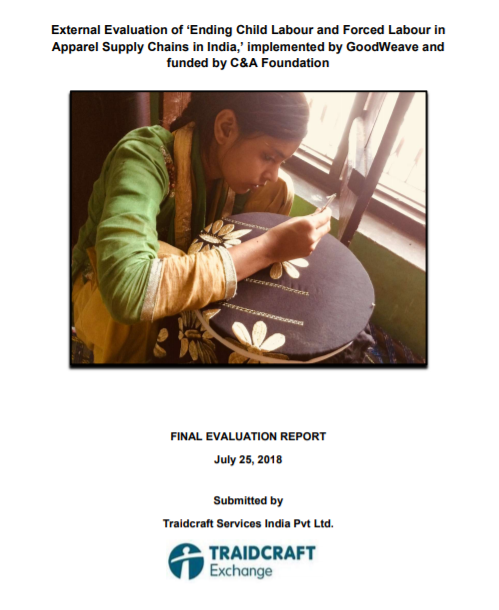 This external, independent evaluation assesses the outcomes of GoodWeave’s “Ending Child Labour and Forced Labour in Apparel Supply Chains in India,” implemented by GoodWeave and funded by C&A Foundation. 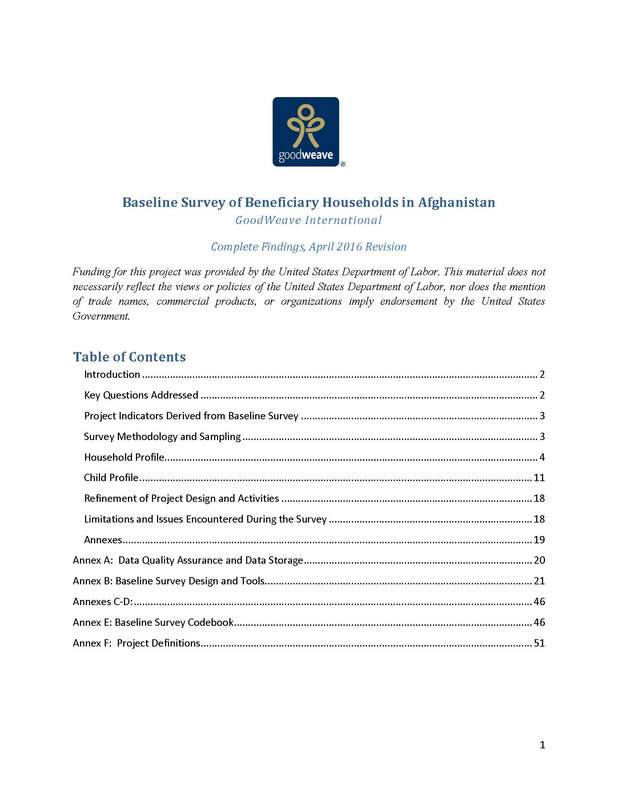 This external, independent evaluation assesses the outcomes of GoodWeave’s Preventing Child Labor in Home-Based Carpet Production in Afghanistan project, implemented from 2013-2018. This report summarizes the evaluation of GoodWeave’s global indicators data collected in 2015. The report examines whether GoodWeave’s program strategies are contributing to the intended change described in the global results framework. by Prof. Eric V. Edmonds and Mahesh Shrestha, for ICF International, 2013. A non-technical summary of You Get What You Pay For: Schooling Incentives and Child Labor, NBER Working Paper No. 19729. US Department of Labor Bureau of International Labor Affairs Schooling Incentives Project Evaluation Study. 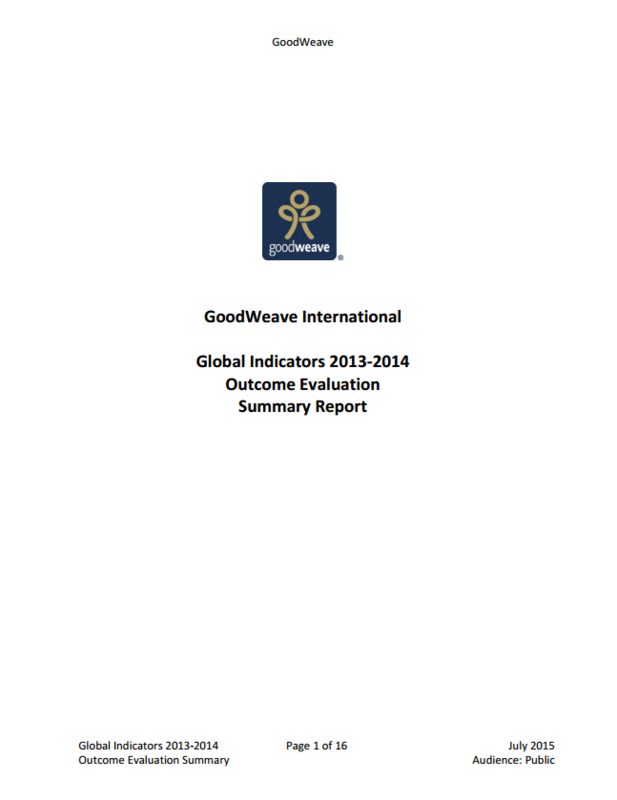 This report summarizes the evaluation of GoodWeave’s global indicators data collected in 2013-2014. The report examines whether GoodWeave’s program strategies are contributing to the intended change described in the global results framework. GoodWeave’s Weaving Opportunities program is a vocational training initiative for carpet weaving that began in 2013 to provide at-risk and impoverished women with marketable skills and to replenish the workforce with skilled adult weavers in an industry facing a labor shortage. To evaluate the program’s impact, GoodWeave assessed weavers placed in jobs to evaluate their change in income and earning potential. GoodWeave is partnering with Good World Solutions (GWS) and the Labor Link platform to survey workers via mobile phones at GoodWeave inspected supply chains in India. The goal of the project is to provide data sourced anonymously and directly from workers, which can help to assess the strengths and weaknesses of the compliance procedures and determine the impact in the communities served.